Okuma Australia and Okuma New Zealand are pleased to make a selection of Videos available about our business and about topics of interest that are in some way related to our Company or the products we sell. We have obtained the permissions and right to feature these videos, images, names, locations, persons involved and the work that is visible on any machine in any video. These permissions do not imply ownership albeit as custodian of this website, copying, reproducing, use or removal of any data or video content from this website without written permission of Okuma Australia Pty Ltd is strictly prohibited. 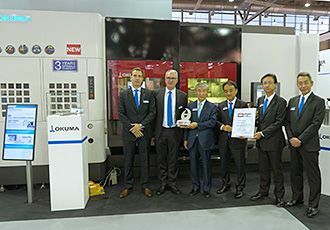 Okuma exhibited 14 machines including Multitasking, 5-Axis Machining Center, Double-Column Machining Center, Grinder, to name a few; with the theme of "Anybody can connect to the future, at anytime and anywhere".